Request yourself and Sherlock Holmes investigate bizarre incident of possible lycanthropic origin. Please call on me at the Horse and Trollop at your earliest convenience. I should not have considered the communication significant were it not for the one word – lycanthropic, and I admit a chill ran up and down my spine as I recalled that business in Staffordshire when the chomped-up and bloodied remains of a local boy were found scattered around a graveyard. Our old pal Inspector Buckingham Caddy had some involvement in the case, though the killer – human or otherwise – has never been found. No doubt you will scoff at the idea of werewolves, Holmes, but medical curiosity and a little knowledge of the disorder known as clinical lycanthropy has occasionally prompted me to wonder about the authenticity of such conditions. In any case, I should be interested in at least meeting this chap and hearing what he has to say. I shall send the boy round with this note and look forward to meeting you at the aforementioned hostelry at noon. Having made my presence known to a ruddy-cheeked subordinate in the lobby, I seated myself near the hotel’s bay window where I could peruse The Times as well as the main staircase. I’d only been there a few minutes when someone tapped me on the shoulder. I looked up into a face so completely beautiful that for a moment I forgot my manners – my mouth dropped open and I let the newspaper slide to the floor. The newcomer crouched down, picked it up and laid it on the table. “You are Doctor Watson, aren’t you?” she said, her blonde locks tumbling magnificently around her shoulders. “Judith Hirsch, MD. You were expecting a man, weren’t you?” She gave me a coy grin, leaving me in no doubt I’d made myself look foolish. “An American, actually,” I said. “Your pursuer?” I said, glancing around the lobby. At that point I suggested we order tea and scones before proceeding further. As the maid scuttled off to the kitchen, my guest leaned forward and patted my knee. I was about to laugh in a nonchalant manner when a shadow fell across the table. 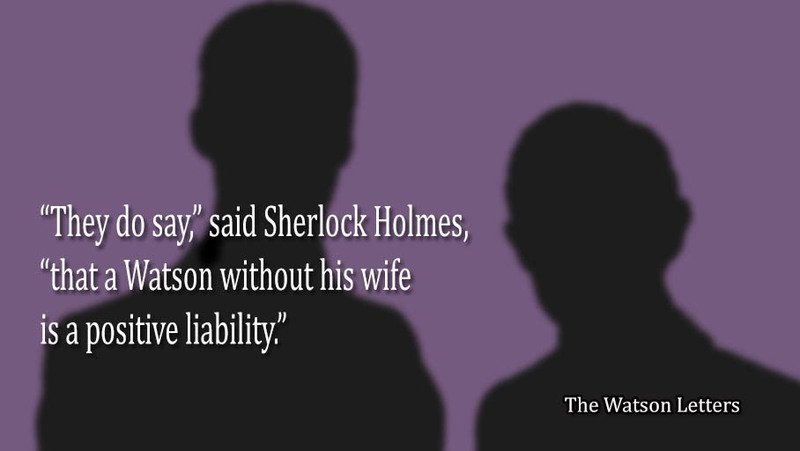 “They do say,” said Sherlock Holmes, “that a Watson without his wife is a positive liability.” He grinned sardonically and slid into a chair next to Doctor Hirsch. A familiar fragrance caught my nostrils and I looked up at the rather vexed visage of my dear Mary. “You know, Johnny,” she purred, “sometimes I wonder if I married the wrong man.” She glanced pointedly at Holmes, who gave a noticeable twitch of disbelief, though the expected sharp retort at such a ridiculous proposal did not materialise. The girl arrived with a tray and while Holmes ordered two additional teas, we all made ourselves comfortable. “I must admit,” said Mary, tucking into a jam scone, “for a man, you’re extraordinarily pretty.” She patted Judith’s knee and squeezed her leg with enough force to cause the other woman to wince. “An American werewolf?” said Mary. “Really?” said Judith. “then how d’you account for this?” With that, she undid the cuff of her sleeve and pulled it up, revealing three massive gashes down the length of her arm. Judith Hirsch said nothing, but shrugged and sipped her tea. Awesome, Colin. I read this to Michael. ‘I quite agree’, he said giving her a sardonic smile.